Source: Red Valve Company, Inc.
Red Valve Company, Inc. from under the burden of high electricity costs and continual maintenance was an important goal the Du Page County, IL, Public Works Department had for its secondary wastewater treatment plant. The staff wanted to convert their aeration tank to handle the treatment of excess flow, but still have the basin available for the normal biological process when necessary. 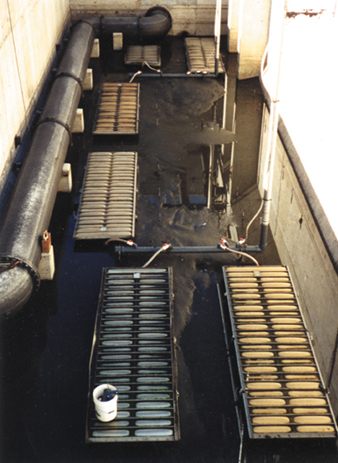 The aeration process used by Du Page is typical of many wastewater plants. Large blowers inject air into the wastewater being treated to provide oxygen for the microorganisms in the liquid. During aeration, it is important to keep the wastewater mixed so that settling does not occur prematurely. If the air supply is interrupted, the material settling out tends to clog most types of diffusers. Of course the air supply must be kept running 24 hours a day, 365 days a year. Accomplishing this often constitutes the single biggest expense in operating a treatment plant. William Bowles, operations manager for Du Page County Public Works, explained the situation in his facility. He said, "We had to keep air blowing through the system, and at least six inches of water above the top of the diffused air panels. We were spending a big portion of our budget just to keep that air moving. It takes a lot of energy to continually operate the blower." Bowles and Gregory Wilcox, director of the plant, decided there had to be a better way, and they were able to come up with a suitable alternative—a novel check valve. Constructed completely of elastomer, the Tideflex air diffuser check valves were shown to provide optimal aeration and mixing, and were not at all prone to clogging. Positive differential pressure opens this unusual valve and allows flow. Reverse differential pressure seals the duckbill-shaped exit orifice, preventing any backflow of solids and liquids. The elastomer duckbill is able to seal around entrapped solids. These valves have demonstrated that they eliminate the concern of clogging air manifold and piping systems when blowers or compressors are stopped during normal shutdown or power failure. The managers from the Du Page facility first saw the Tideflex valve at the 1996 Water Environment Federation (WEF) show in Dallas, and thought it might offer a solution for their clogging problem. Installed in an aeration tank, the check valve wouldn't allow water to get back into the header system because of the positive differential pressure developed. It also would break up air bubbles to a size that promotes diffusion of oxygen into the water being treated. To test the Tideflex diffusers in a pilot-size installation, the Public Works Department staff retrofitted an aeration tank at one of their smaller plants. They removed the conventional diffuser panels and put in their place a bank of the new style units. The retrofit project cost approximately $12,000, plus two weeks labor for three people. Normal air flow requirement for the west aeration tank while configured with the stainless steel diffuser tubes was 1,700 cfm. The optimal constituent parameter to use as an indicator of treatment effectiveness is the ammonia level in the effluent. Any reduction in treatment performance is indicated first by variances in the concentrations of ammonia in the effluent. The ammonia level in the effluent, prior to installation of the new diffusers, ranged from 0.1 to 0.3 mg/l. Upon installation of the coarse bubble diffusers, plant operators initially reduced the airflow to the tank by 20% to 1,400 cfm. The ammonia level in the effluent remained stable, and mixing was observed to be very turbulent. The unit cost for power requirements at the facility is approximately $8/cfm per year, so this initial reduction in airflow was estimated to produce an annual cost savings of $2,400. These first results encouraged the Du Page operators to further reduce airflow to 1,100 cfm—the minimal system operating level determined by the least amount of pressure needed to operate the airlift pumps. Once again, the ammonia levels in the effluent remained constant. These mixing velocities now provide the county with annual savings of over $5,000. The success of the pilot testing cleared the way for Du Page to take the next step—conversion of the main tank. Retrofitting the main tank, however, was to be a bigger job than the pilot project. More than 40 panels—each weighing about 250 pounds—had to be removed. They were fabricated using stainless steel, are four-ft wide by 12- ft long, and are being replaced with several hundred of the new style diffuser. In addition to cost savings in electricity, Bowles confirmed that another distinct benefit of the new valves is the reduced maintenance load. The aeration panels have been difficult and costly to maintain. They are susceptible to cuts and holes, and the soft rubber membrane surrounding the panel had to be replaced frequently, a labor-intensive procedure. Asked what is involved in maintaining the new diffuser valves, Bowles said, "Nothing. You install them, and you forget them. We've taken the tank down a number of times since we put it back in service a year and a half ago, and we've not noticed any problems with any of the valves." He finished by saying there has been no need for any maintenance on the system at all. Editor's Note: This article was submitted by Jeff Kelly, product manager for air diffusers at .